On the 1st and 3rd Thursdays of each month here on Michele Made Me, I step aside and let some other crafty soul take care of things. Today I’m so happy to have the gifted Melissa of Artist in LA LA Land guest-post. Have you ever met her? Well now’s your chance, eh? Please make her feel at home! First of all, I wanted to thank Michele for this opportunity to do a DIY tutorial on her wonderful craft blog. I’ve been following it for over a year and have shared all the DIY fun, joy and tears with her and all you blog readers. It’s a real honor to be here with you. 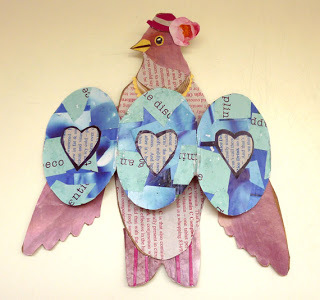 Today, I’m going to take you through the process to make a Springtime Bird Fold Out Wing Card. I’ve created different versions of this clever card (which is also an articulated paper doll) for my online shop and blog, Artist in LA LA Land. 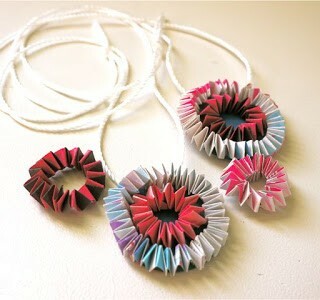 But I designed these ones special for you and they are made completely out of recycled paper and junk mail. 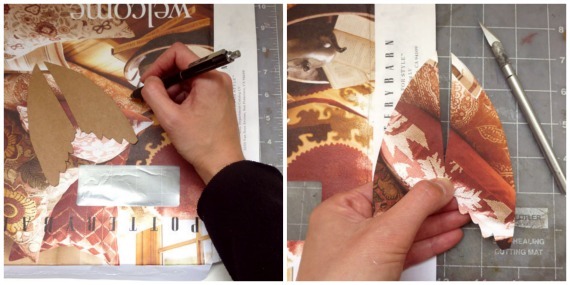 self-healing mat or a thick surface you can cut on (like thick cardboard or an big old book. 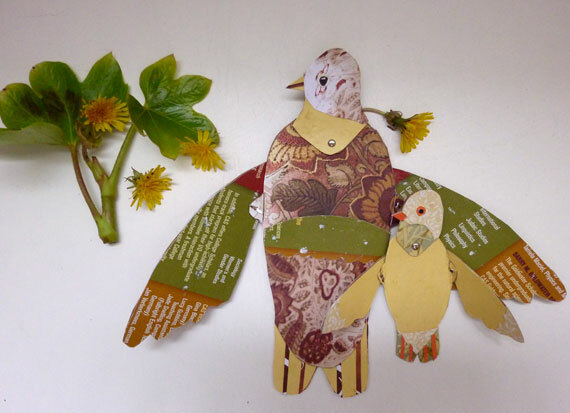 printable PDF I created for you at this link: Spring Birdie Fold Out Wing Card. It has the bird patterns and directions on it. Read all the directions and print out the PDF. You could easily make the Bird Fold Out Wing Card on your own after reading the PDF, but let’s do it together here, just to be extra sure of how to do it. 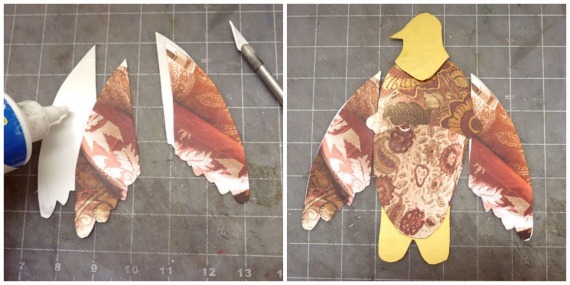 Cut out all the PDF pattern parts and trace them onto the thin cardboard. Cut out the cardboard parts. I think the fun part starts after you’ve done this prep work. Now, you get to decorate all those cardboard parts with your recycled paper. 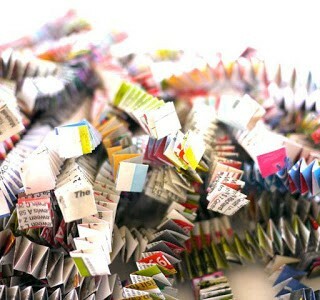 Choose the papers you want and think about how the colors and patterns will work together or not. I think since you’ve created quilts and done crafts before, you’ll be pretty good at this. I only used paper, but feel free to use washi tape, old ribbons, glitter, scraps of paper or whatever you have in your craft supplies at home. 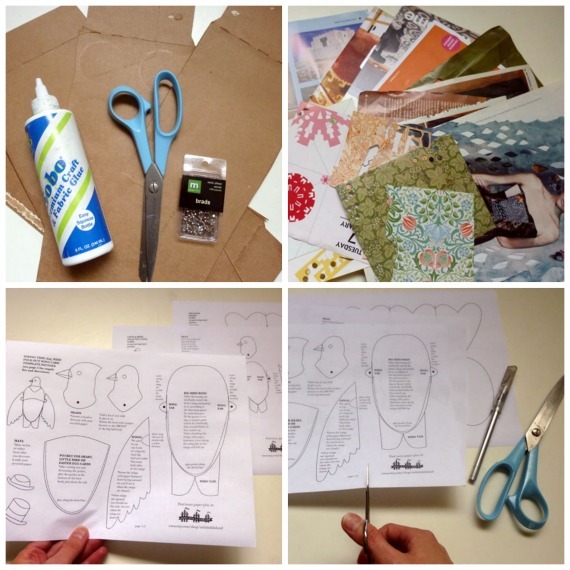 Trace around the cardboard parts onto your chosen paper. 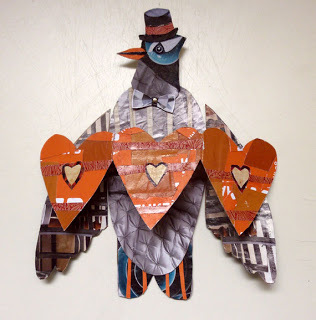 Cut out the pieces from the recycled paper. Then glue the paper to the cardboard. 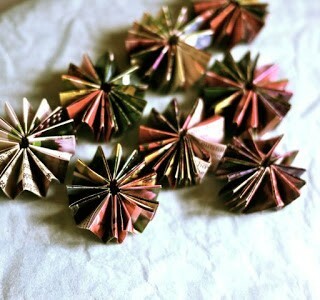 Take your time and make something really special and pretty. Remember both sides of the wings will need to be decorated. The rest of the pieces of cardboard will only need one side decorated. After decorating the bird, glue on the pocket as the directions say (add glue just around the bottom edge of the pocket and stick it to the bottom of the bird above the tail). 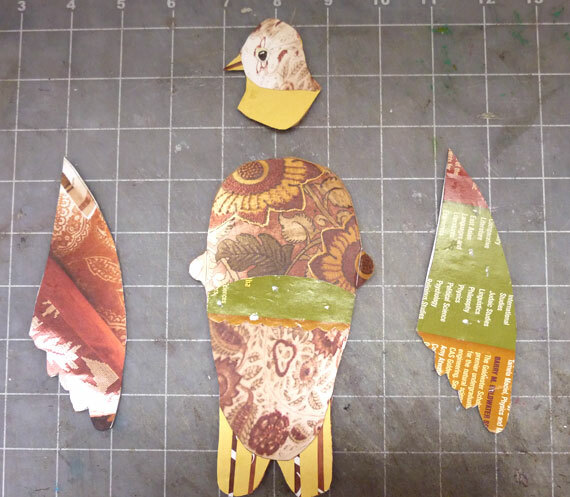 When all the decorating and gluing is finished, you’ll want to assemble the bird with the paper fasteners as the directions say (the wings to the wing tabs and the head to the body). I make a tiny “x” with my exacto blade to make holes for the paper fasteners, but you may have a tiny whole punch or an awl to do this. Then repeat the same process for the rest of the birds, little bird, heart and egg. The little bird, heart and egg carry your special message to your recipient. 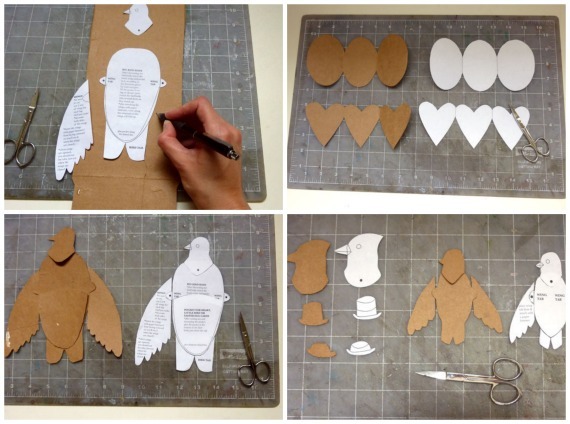 When making the little bird, keep in mind you’ll want to write a message on his belly and/or wings, so don’t decorate with paper that won’t allow you to write a message upon it. For the hearts and eggs, your message will be written on the blank side of the cardboard. When you’ve finished your Fold Out Wing Bird Cards, tuck either the little bird, heart or egg in the pocket of the big bird. Then fold closed the wings and insert him in an envelope. It will fit in an 8.75″ x 5.75″ envelope. 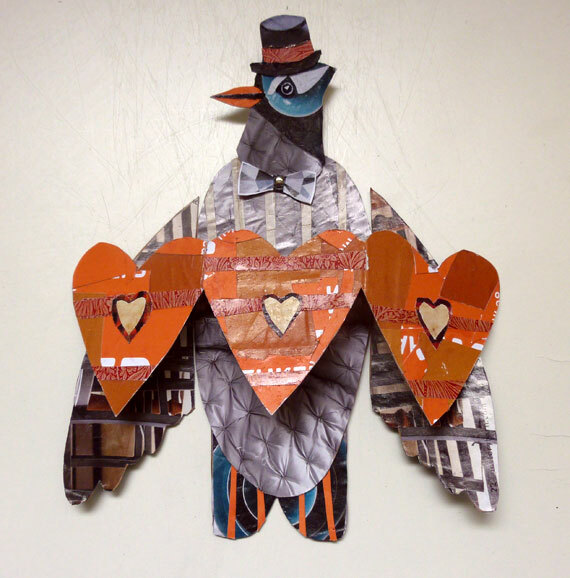 Your recipient will be thrilled to receive this very special and very clever bird card. Not only do these birds carry your special message, but they can also be played with. The wings fold in and out, but they also flap up and down. I think that makes them twice as fun. Use them for mother’s day and father’s day which are coming up. And why not for a birthday, to say I LOVE YOU or to your special pen pals! There’s lots you can do with them. I think these three birds tell a story too. First, there was love as you can see with the fold out heart card. Next, there was a union made as you can see with the egg card. And finally, they made a family as you can see with the little, baby bird card. Have fun celebrating the best moments of your life with these special Bird Fold Out Wing Cards. 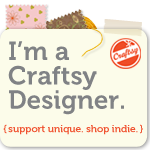 Thank you again for having me here on one of my favorite craft blogs! 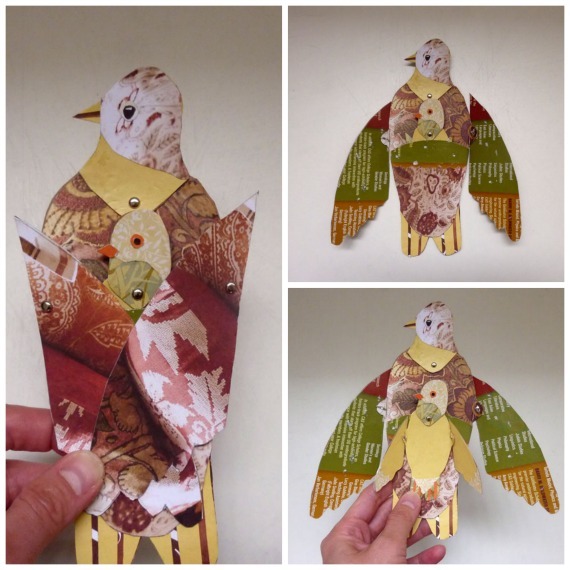 Thank you Melissa for your beautiful Bird Fold Out Wing Card guest-post. I’m so happy you could come and share your talent with us today. What a super way to start the day! P.S. Have an idea for an eco-craft? Seeking a new audience? 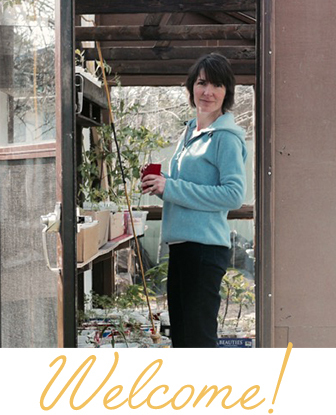 Consider submitting a guest-post idea to Michele Made Me’s “You Guest It”! Check out the details HERE. I love this project! How fun! Thanks for sharing a new (to me) artist who I will now go check out! Pinned to try soon! 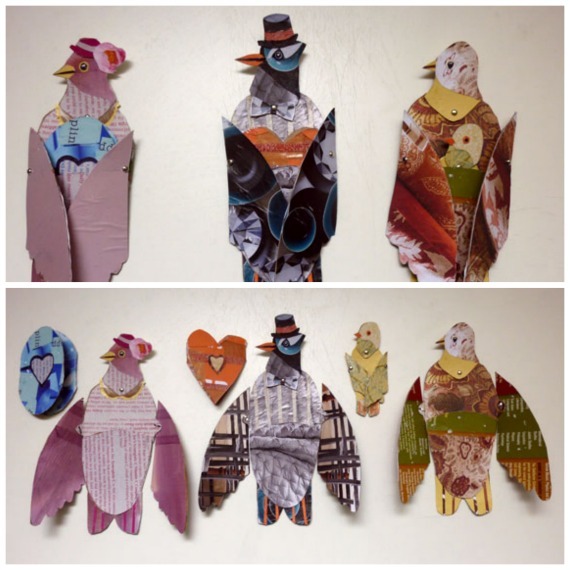 This is really amazing!A great, elaborate and attractive project for the paper craft lovers! Thank you for sharing Michele and Melissa!